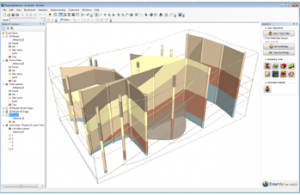 EnterVol provides true 3D volumetric modeling in the ArcGIS® Desktop environment. The EnterVol Suite consists of 4 components which are installed as extensions in ArcMap and ArcScene. EnterVol provides high level volumetric modeling that was previously not available except in our own Earth Volumetric Studio. EnterVol uses the same proven technology in C Tech's Earth Volumetric Studio software which is used worldwide by customers such as the U.S. Environmental Protection Agency, Environment Canada, Chinese Research Academy of Environmental Sciences, U.S. Geological Survey, British Geological Survey, U.S. Army Corps of Engineers, U.S. Department of Energy Laboratories, United Nations, and the majority of the world's largest engineering and environmental consulting firms. GIS centric organizations can now address all of their modeling needs within the familiar ArcGIS® Desktop environment. The EnterVol Suite is priced from $6,000. EnterVol Tools© provides several fundamental capabilities to ArcMap and ArcScene users including building closed multi-patches (pseudo volumes) from two rasters of arbitrary resolution or extent, enhanced view controls, labeled axes, data labeling, direction indicator(s) and more. This product is included with all components of the EnterVol Suite, but is also available separately from $299. C Tech has two product lines: Earth Volumetric Studio (Studio) and EnterVol for ArcGIS. Our current software versions represent the culmination of C Tech’s 28 years of 3D modeling development. EnterVol is targeted at geologists, environmental engineers, geochemists, geophysicists, mining engineers, civil engineers and oceanic scientists. 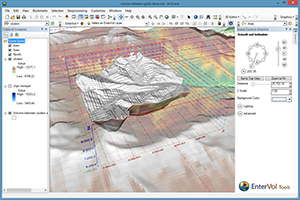 EnterVol for ArcGIS is a suite of extensions for ESRI’s ArcGIS which brings true 3D volumetric modeling to the ArcGIS Desktop environment. 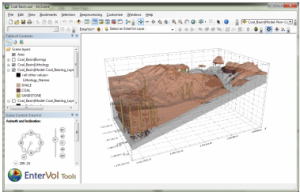 Though it is somewhat basic compared with Studio, it provides the ability to create true 3D volumetric models of geologic and analytical data which are not found in any other GIS software. Furthermore, C Tech has developed EnterVol and Studio to provide a high level of interoperability to allow larger organizations to leverage their GIS departments as adjuncts to their 3D modeling groups. Whether your project is a corner gas station with leaking underground fuel tanks, a geophysics survey of a large earthen dam combining 3D resistivity and magnetics data, or modeling of salt domes and solution mined caverns for the U.S. Strategic Petroleum Reserves, C Tech’s Earth science software has the power and functionality to address the most challenging tasks. Our software is used by organizations worldwide to analyze all types of analyte and geophysical data in any environment (e.g. soil, groundwater, surface water and air). We take great pride in knowing that our biggest market segment is modeling of soil and groundwater contamination. EnterVol addresses every stage of the problems that face the environmental consulting industry. There are literally thousands of contaminated sites worldwide where C Tech’s software has helped to understand the contamination and plan and execute the cleanup efforts. I must admit that we at C Tech get rather frustrated trying to differentiate our company and products from the plethora of products that have jumped on the 3D bandwagon. From our perspective, the term “volumetric” is the simplest discriminator. However, to really understand why volumetric is important and different, you need to understand the difference between three-dimensional space and the dimensionality of objects. All “real” objects in our world exist in three-dimensional space. Their location needs to be specified with X, Y, & Z coordinates. As we get more technical, if an object is rigid, we need three additional angles to describe its orientation just as we describe the yaw, pitch and roll of a plane. If the object is not rigid, things get far more complicated since we need to break it down into small “elements” and describe the locations of each of those elements and how they connect to their neighbors. To complicate matters further, time (the fourth dimension) becomes the driving impetus for how the object would change based on the forces and conditions that exist in the system we are describing. Returning to the issue of the dimensionality of objects, most companies that consider their software 3D, deal only with points, lines and surfaces in three-dimensional space. A good example would be GIS software. This class of software creates 3D objects that might enclose volumes. However, even when this software can compute the volume of these enclosed regions, the models of these objects are merely surface skins, like balloons. Object dimensionality refers to the space occupied by the elements used in the modeling process. There are 8 commonly used elements (cells) which are shown in the figure below. Points do not have length, width, or height; therefore, their dimensionality is zero (0). Lines are dimensionality "1" because they have only length. Dimensionality 2 objects such as quadrilaterals and triangles have both length and width and are referred to as areal cells because they have area. Areal cells in three-dimensional space is the limitation for more than 95% of 3D software. In the graphics industry, we often refer to software that only displays points, lines and surfaces in 3D space as 2.5D. The remaining four cell types ranging from tetrahedrons (triangular based pyramid) to hexahedrons (boxes) are all truly volumetric. These are Dimensionality 3 objects with length, width and height. When creating surfaces, areal cells are used, but when creating truly volumetric models with three-dimensional grids, we use volumetric cells. 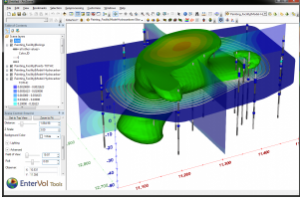 If you collect data within volumes, rather than on surfaces, you need volumetric modeling. If you punch (or drill) a hole in the ground and collect data as you go down, you’re collecting volumetric data. For many years, this data has been displayed as individual boring logs, each one separated from the others, disconnected from their 3D coordinates. But once you put everything into its true 3D space and treat it as volumetric, the true power of the data is revealed. Volumetric modeling offers many advantages over surface representations. When a volumetric model is created, we use geostatistics to estimate (interpolate and extrapolate) data into the volume based on sparse measurements. The algorithm used is called kriging, which is named after a South African statistician and mining engineer, Danie G. Krige who pioneered the field of geostatistics. Kriging is not only one of the best estimation methods, but it also is the only one that provides statistical measures of quality of the estimate. The combination of kriging and volumetric modeling provides a much more feature rich model than is possible with any model that is limited to external surfaces and/or simpler estimation methods such as IDW or FastRBF. It allows us to perform volumetric subsetting operations and true volumetric analysis, and we can defend the quality of our models based on the limitations of our data. 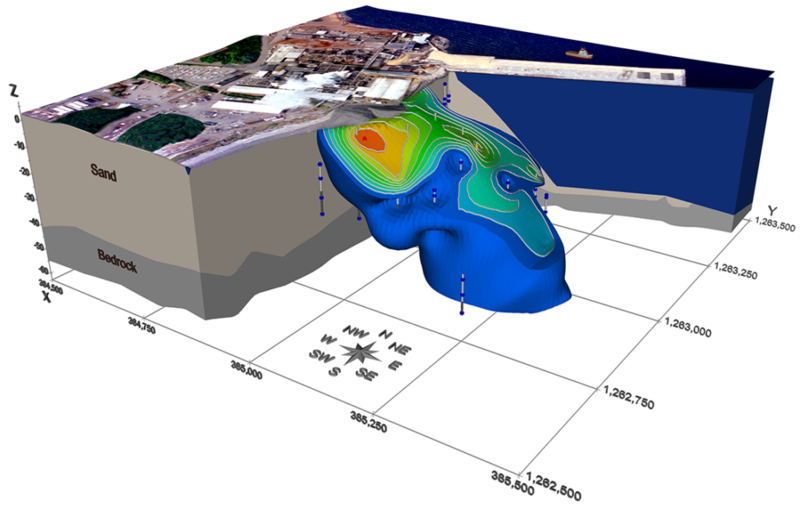 In the field of environmental engineering, where our software was born, volumetric modeling allows us to determine the spatial extent of the contamination at various levels as well as compute the mass of contaminant that is present in the soil, groundwater, water or air. During remediation efforts, this is critical, since we must confirm that the mass of contaminant being removed matches the reduction seen in the site, otherwise it is a clue that during the site assessment we have not found all the sources of contamination. This can result in remediation efforts which create contamination in some otherwise clean portions of the site. An additional benefit of volumetric modeling for all industries is the ability to slice, cut or otherwise subset the model to reveal analytical results internal to the volume without needing to re-estimate data onto the newly revealed surfaces. This data can include multiple analytes, statistical measures of quality, geologic materials, geophysical data and more.